Love fire, and curious about many different natural ways to heat and cook? Especially interested in Rocket Stoves? Then this is the class for you ! 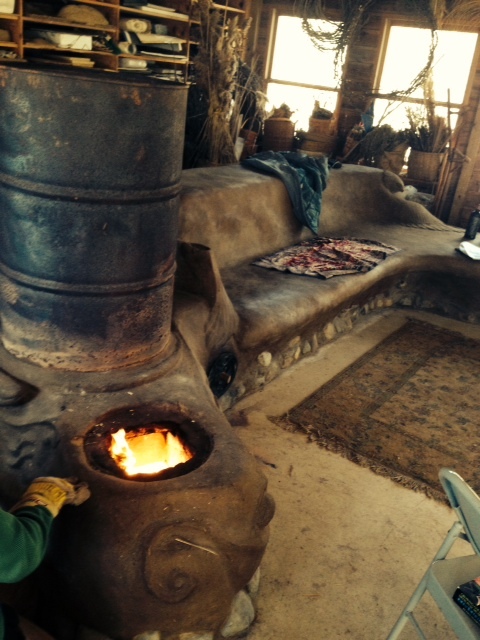 This unique & practical workshop focuses on creating useful heat efficiently from local materials. Fee includes a copy of the new edition of the Rocket Mass Heater Book, Tour buildings & Stoves on site, Hands-on experiences, Principles of construction, Code and more. This class is limited to 15 students so register now. 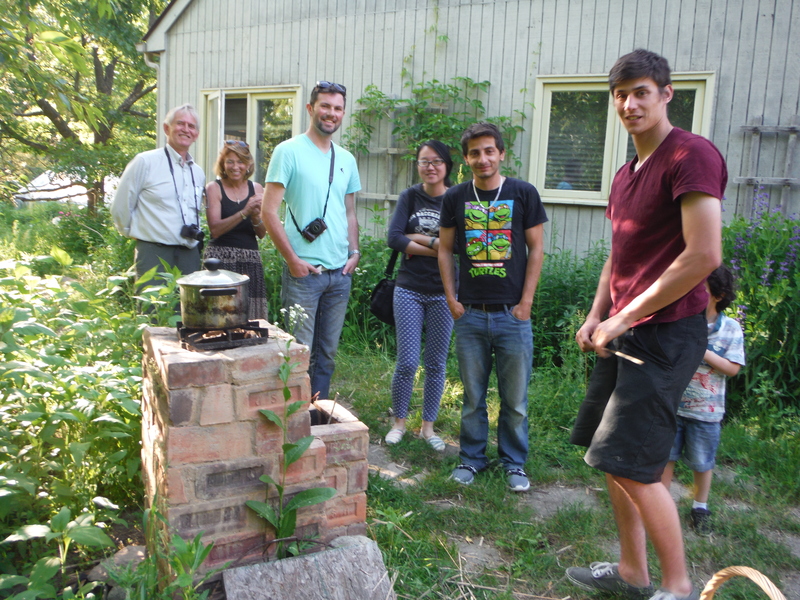 Link to Blog post and pics from last Rocket Stove Workshop ! $150 thereafter, with RSVP, if there is room. Saturday only: $65 ~ by December 28th. $75 by Jan 3. $85 thereafter with RSVP if there is room. Some Worktrade Scholarships available. Bring your own bag lunch. 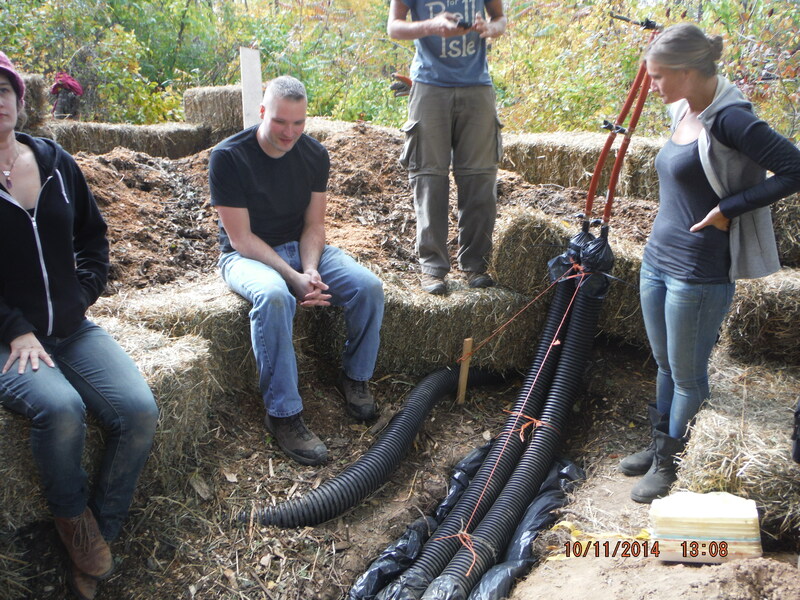 Compost Furnace – Tube on the left brings air underneath the pile. The 2 tubes on the right contain insulated pex tubes ~ hot supply and cold return, moving hot water from the pile to the Strawbale Studio floor tubes. Day 1 Arrive at 9:30 a. Class starts at 10a. See a Rocket Mass Heater, Rocket Mass Cooker, Hay Box Cooker, Rumford Fireplace and Pocket Rocket, the Earth Oven and NEW COMPOST FURNACE ! 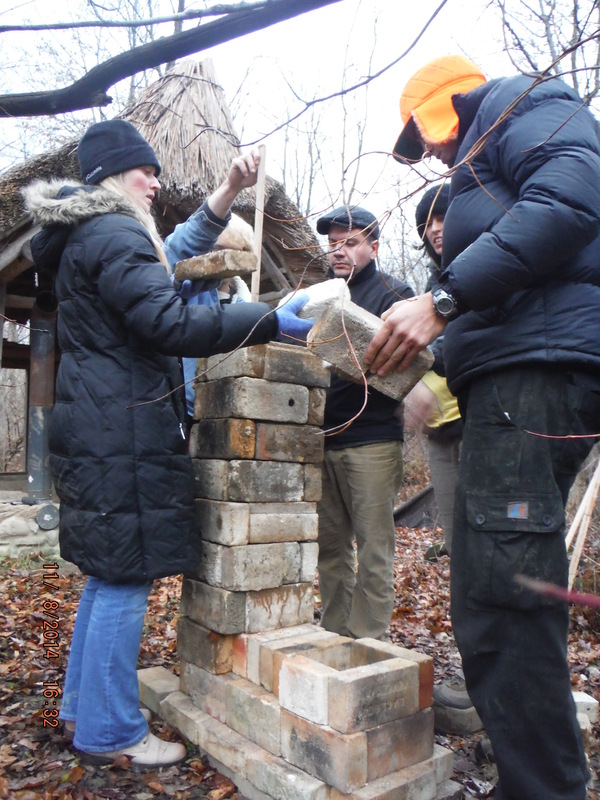 Learn the principles of Rocket Stove construction. Q & A. We will fire some of these stoves up, and discuss the principles of how they work and are constructed. 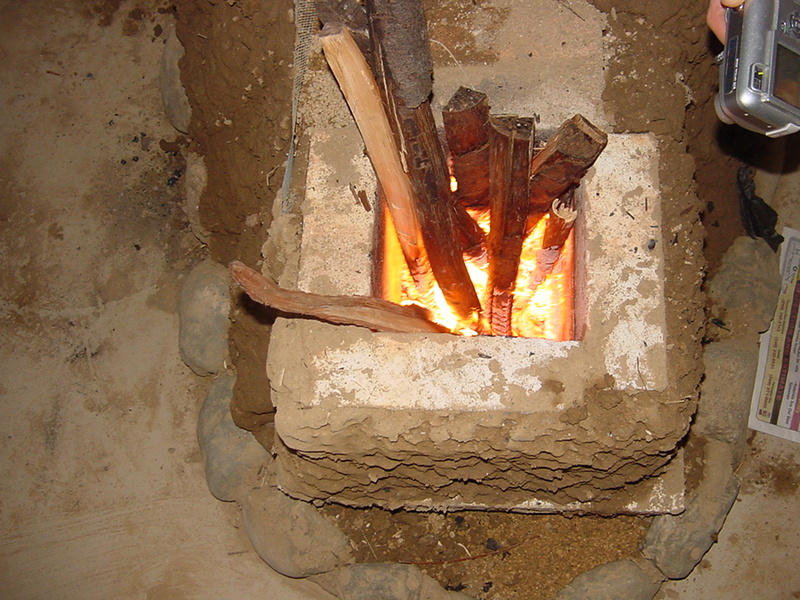 Then we will construct a mock up the combustion unit of a Rocket Stove, using bricks. 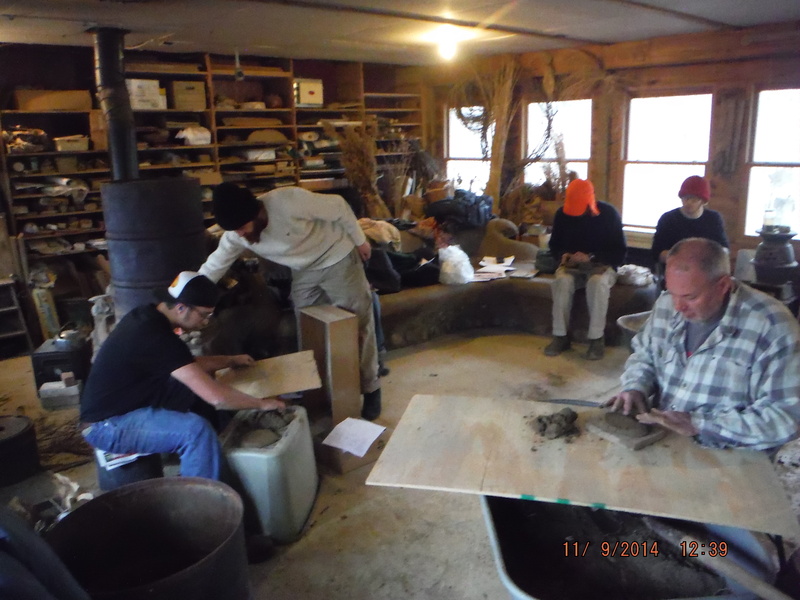 You will learn to identify and locate appropriate soil and make earthen mortar and Cob used in the construction and shaping of the stoves and benches. Evening: a choice of Bonfire or browsing the Resource Library. Day 2 Arrive 9:30a. 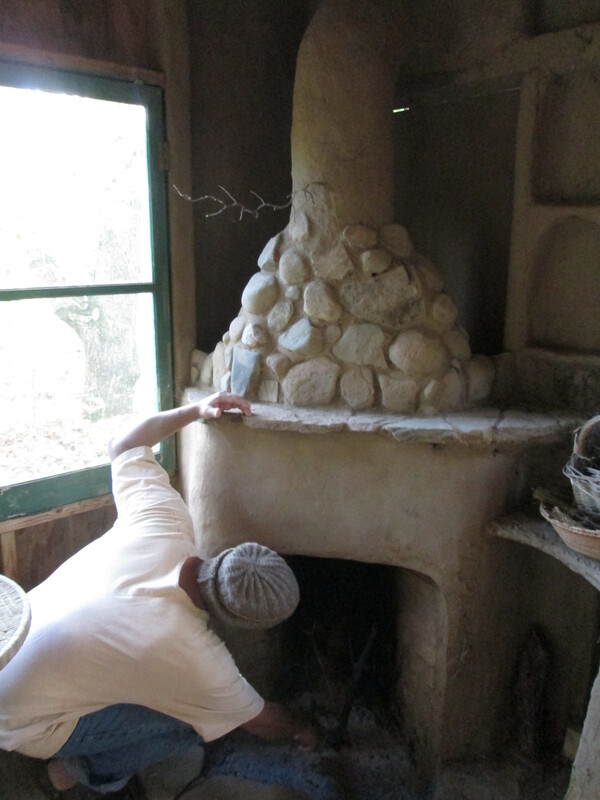 Class 10 – 5p Get hands-on experience making and applying Cob, Finish Plaster and oils, design & construct a Cob Model of a stove to take home, and watch the latest videos from Ernie & Erica, Rocket Stove experts. Introductions – our interest and background in fire and rocket stoves. Distribute Handouts & Rocket Stove Books. Insulative Cooking, overview. 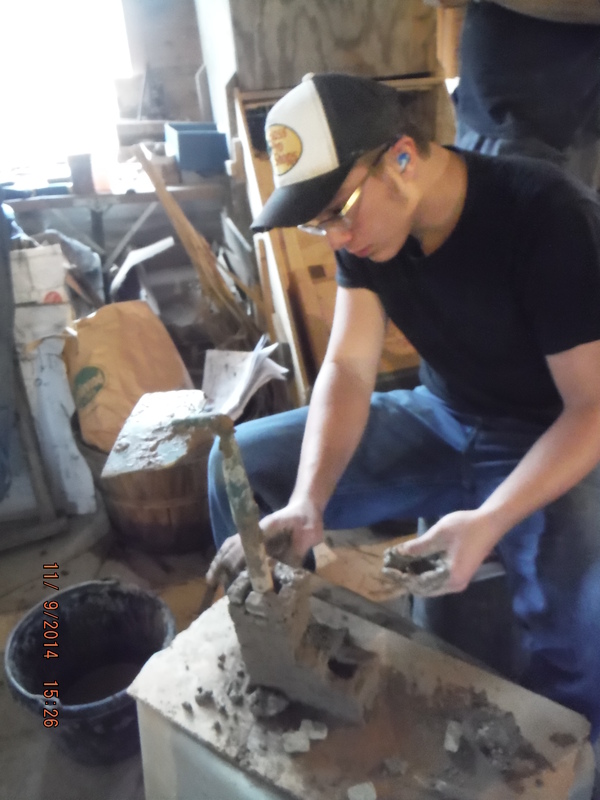 Start up the Rocket Stove, Tour of Fire Devices on the Land. Evolution of fire efficiency and design. Class on the Principles of Rocket Stoves and Code considerations. 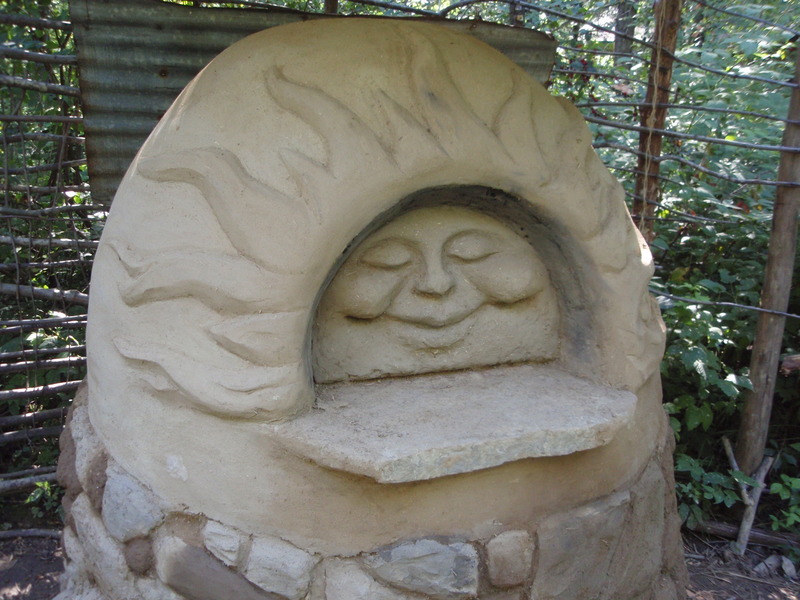 Make Cob and Earth Mortar in the Red Shed, make small cob bricks. Discuss various applications of Rocket Stoves. Tour the Kids’ Cottage, see the Rocket Mass Heater under construction. 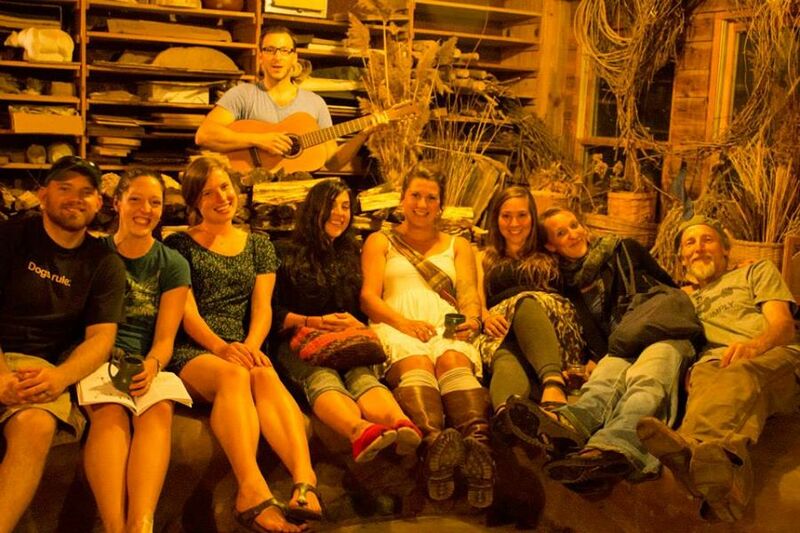 Build a Mock-up of the Rocket Stove Combustion Unit and fire it up. Set up the Hay Box Insulative Cooker with food that will be ready for lunch. Meet in the Red Shed. Keep Rocket Stove going. Review principles. Make cob and begin the sculpting of a small model from mini bricks and cob to take home. Heat Lunch on the Rocket Mass Heater Heat Exchange Barrel. Try out the mini oven. Experience Rumford Fireplace, Haybox Cooker, Biolite Stove, Pocket Rocket Stove. Continue with Model-making. View select video clips by Ernie & Erica. Making a Cob Model Rocket Stove – should work ! How fire and Rocket Stoves work (and don’t work).